Korean Air is Korea's international airline company with its headquarters located in Seoul, Korea. The airline and related subsidiary serves 130 cities in 45 countries in terms of both international passenger division and cargo division. Korean Air's domestic division however, serves 20 destinations. Being the top 20 in the world in terms of passengers carried by any airline, it is also considered to be the largest airline carrier in South Korea. The second largest flag carrier in Korea is Asiana Airlines. 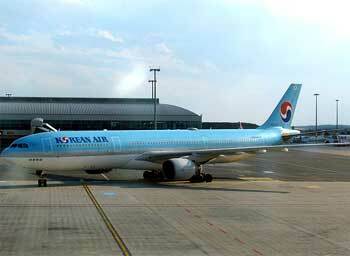 Korean Air's main base and international hub and gateway is the Incheon International Airport, South Korea. There is also a satellite headquarters campus maintained by Korean Air located at Incheon International Airport which is just 30 minutes drive away from Korea's capital, Seoul. Global headquarters and operations center of Korean Air is located right in its capital city of Seoul, Korea in the Kangseo-Ku district. Its domestic office campus are at Gimpo International Airport, also in Seoul. Other smaller domestic bases are located at Jeju International Airport and Gimhae International Airport, Busan. Korean air has recently received the highest ratings in two catigories namely the Best First and Business class Airline and also the most popular Frequent flyer program which they manage to beat both Cathay Pacific Airways and Singapore Airlines in the year 2006. Korean Air is pleased to announce the opening of service four times per week to Zhengzhou, the home of China's most famous Kung-Fu landmark, the Shaolin Temple, and the site of China's ancient cultural origins dating back 3500 years ago. In the year 2004, a corporate objective name called "Excellence In Flight" was introduced by Korean Air. In an ever intense competitive industry, Korean Air has come out with a new corporate image which also incorporates the themes of the "Spirit of the New Korea" and "At Home". This change is necessary in order to show a more comfortable inflight environment for both cabin crew and passengers. Through various advertising, public relations advertising and Internet, print and media presenting its leadership in SkyTeam Alliance and its partner airlines, this new image has proven to be a successful motivation and driving force for both Korean Air as well as Korea's tourism market in general. Some of the changes made with the new corporate image include new employee uniforms designed by Gianfranco Ferre, a famous Italian fashion designer. Landor, a global brand development company has also contributed to the change and several others which include new products and interiors, as well as new services being introduced to the airline.